My first and still my favorite deck for a while now! It's a Prossh token deck, not a Food Chain deck. Trying to not make the deck not too dependent on Prossh incase they have ways to shut it down + to keep games more dynamic. Would love any kind of feedback. Vicious Shadows on-top of having a lot of fodder, it triggers off anyone's creatures dieing! Shared Animosity / Beastmaster Ascension steroids for all those little weenies. Purphoros, God of the Forge is difficult to remove and does an absurd amount of damage. Dragon Tempest + Descent of the Dragons kills one person, potentially 2 at the same time. At minimum sacing 6 kebolds + prossh will dome someone for 42, the leftover 7 at the other and the swing with 7 x 4/4s. To a lesser extent Dragon Broodmother / Nesting Dragon slowly ticks up in damage every turn. Earthcraft + Squirrel Nest death by a million squirrels! Bonus points if you can chuck em at people's faces with Goblin Bombardment . Tempt with Vengeance + Omnath, Locus of Rage is alot of walking lightning bolts. Ashling's Prerogative potentially taps opponents stuff. Anything I run that wants haste is even CMC. I try to fit some kind of "value" package in every deck I make. This one uses Scapeshift ! Temple of the False God & Ancient Tomb technically are ramp for this deck. Just grabbing lands to fix my colors. Kalitas, Traitor of Ghet / Deathrite Shaman stops graveyard loops. Arcane Lighthouse stop boots from letting me steal creatures and just help deal with other hexproof cards. Homeward Path a nonbo with some cards but I still need it vs other decks. Some cards I decided against since they felt like easy wins: Food Chain , Xenagos, God of Revels and Assault Strobe effects. If I was to ever make this deck more competitive, they would go in along with mana dorks, tutors and stax/land destruction. Vaevictis Asmadi, the Dire : He helps deal with some permanents and the pseudo-chaos warp is always fun. Omnath, Locus of Rage : Moment he was spoiled I fell in love. I run straight land ramp over rocks and dorks just to support this card more. Olivia Voldaren : She is a good card that can take over a game alone. 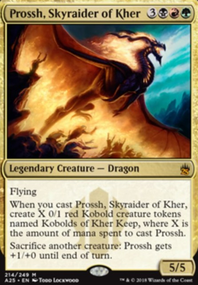 Dragon Broodmother : Prossh wants mass tokens to come in all at once, no matter how bad they are but this card does manage to spit out 4 dragons per rotation which is pretty good if undealt with. Sideboard are cards I have that go in and out, mostly testing purposes or where I'm playing. After seeing my friend use Scapeshift in his deck, I fell in love. Now i got three different scapeshift packages, descriptions shows each one.